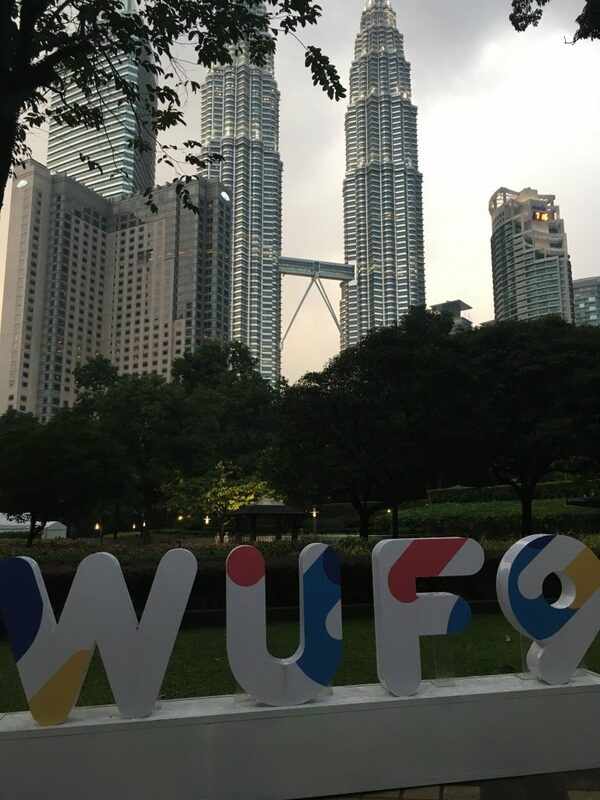 The Global Initiative for Resource Efficient Cities (through UN Environment) had an active participation at the 9th World Urban Forum held last 7-13 February 2018 in Kuala Lumpur, Malaysia, through a series of events (a side event, a networking event, and a training event) that highlighted the work on urban metabolism and circular economy being conducted by the Initiative together with its partners). The full list of UN Environment events can be found here. Below are a few highlights from several events. Co-organized together with the Ellen MacArthur Foundation (EMF) and C40 Cities, this networking event on “circular economy in cities” aimed at demonstrating the possibilities and challenges of applying the circular economy on the city level, considering the role of other stakeholders at local and national levels. The event will explore the relevance of the circular economy from multiple perspectives, with practical examples through a panel discussion. UN Environment Cities Unit Head, Ms. Martina Otto, introduced the session, followed by a presentation by Ms. Sharon Gil, Programme Officer with the Cities Unit, on the importance of city-level work at UN Environment towards supporting low-carbon, resource efficient and resilient urban development for people’s well-being through setting norms and accelerating the adoption of existing technologies. 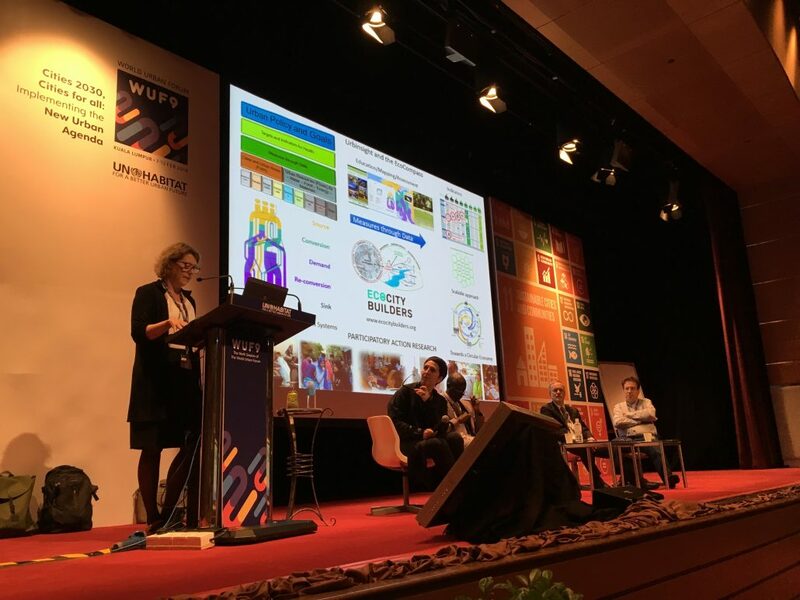 Moreover, she presented the work of the Unit and of the Global Initiative for Resource Efficient Cities on urban metabolism and circular economy, and how the latter links to the Third Transformative Commitment of the New Urban Agenda (NUA). 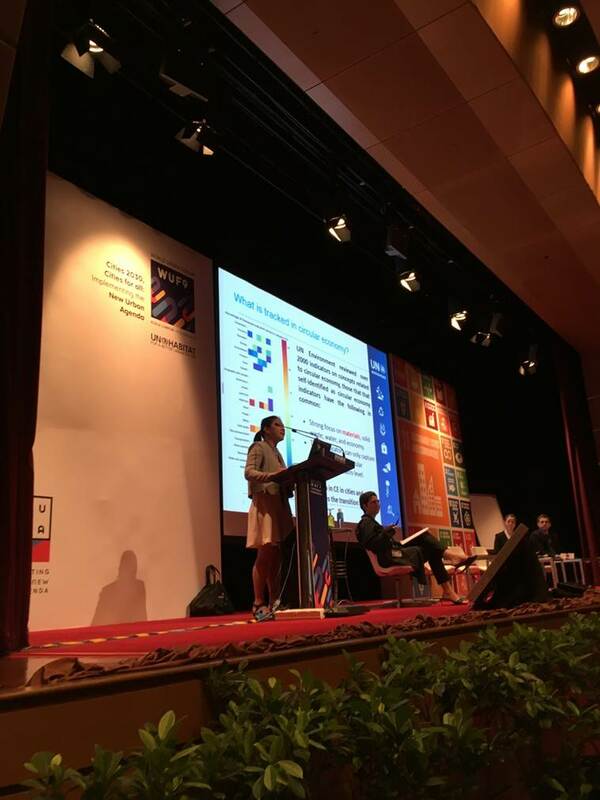 Ms. Miranda Schnitger, Cities Project Lead at EMF followed by framing the circular economy around three principles: 1) design out waste and pollution; 2) regenerate natural systems; 3) keep products and materials in use. Kevin Austin, Deputy Executive Director of C40 Cities followed with a presentation of how circular economy is relevant to the low-carbon agenda and how it helps with the consumption side of tackling carbon. Following the presentations, was panel discussion moderated by Ms. Martina Otto. Mr. Ben SMITH, Director, Energy, Cities and Climate Change, ARUP. Each panelist gave a short five minute initial reaction to the presentations. Ms. MPHAKATHI started things off with a short introduction, highlighting the re-use problems in Durban, specifically on material recovery and water, and highlighted the need to incentivize redistribution. 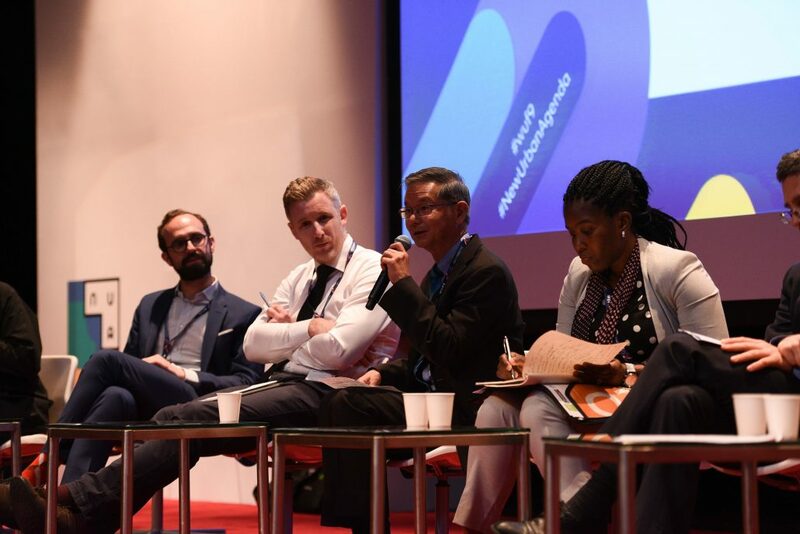 Mr. KHOO presented the Singapore liveability framework, a system’s approach looking at achieving the three spheres of 1) a high quality of life; 2) a competitive economy; and 3) a sustainable environment through integrated master planning and development, and dynamic urban governance. He mentioned that Singapore specifically looks at the issues of water, waste, and food waste. Mr. SMITH from Arup provided a private sector perspective as an independent, global design and engineering firm. He presented their work on circular business models, consultancy services, and the example of a circular house in London. The final panelist, Mr. PELIZZARO from the city of Milan, gave his insights as a Chief Resilience Officer in Milan. They’ve been looking at waste management, particularly from the fashion industry, and how waste from one sector can be transformed into an opportunity for another. In addition, one reaction was that there is a need to make the “zero-waste lifestyle” cool, and that we should be looking at how circular economy could also look at the issue of income inequality. Panelists speaking during the Circular Economy in Cities event at the World Urban Forum. 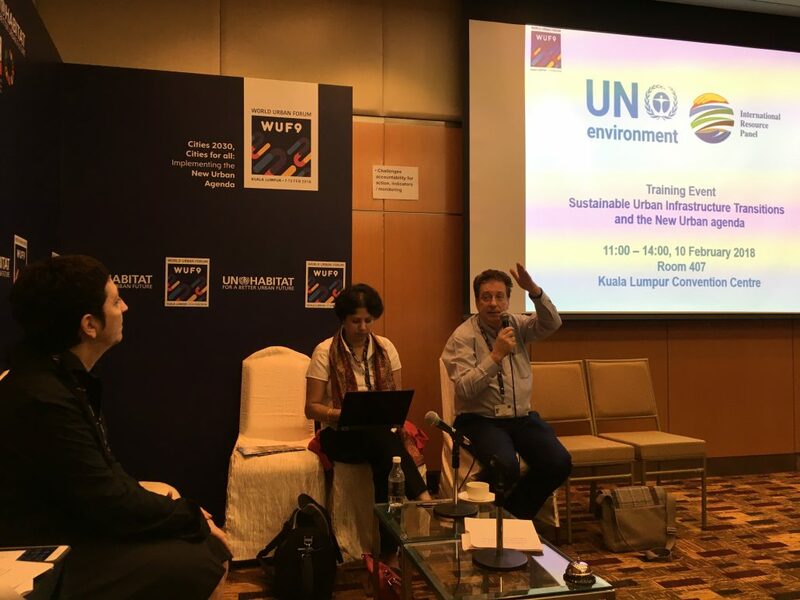 Ths side event present various ways in which community/neighourhood level action is able to influence and impact policy making and action at all levels of governance (city, national, and global). Mr. DIONE started things off by presenting the Senegalese program for building low-carbon and bio-climatic buildings, as well as the new planned city of Diamniado. Ms. Miller then presented Ecocity Builders’ work on evidence-based, participatory approach to urban learning and ecological design, and the work they are doing developing urban metabolic information systems at a context-specific neighborhood level building towards a circular economy that are scalable to a broader and larger scale. Following the presentations, Mr. Serge SALAT, from the Urban Morphology and Complex Systems Institute, and Mr. Michael SCHACK, Director Heating and Cooling Networks and Cogenerations at ENGIE were introduced to react to the presentations given by Mr. DIONE and Ms. MILLER. Ms. Kirstin MILLER, Executive Director of Ecocity Builders (a GI-REC partner) presenting their work at the neighborhood level. 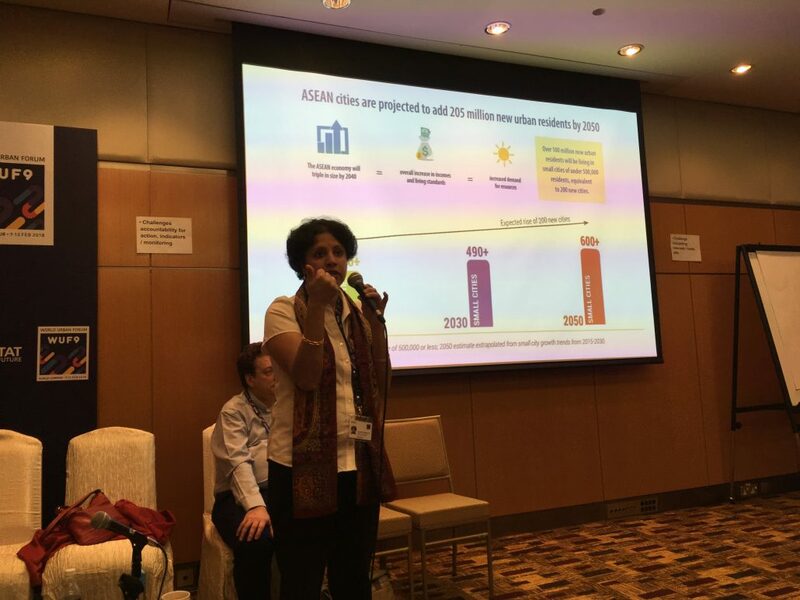 Ms. Anu RAMASWAMI presenting the “Sustainable Urban Infrastructure Transitions in the ASEAN Region: a Resource Perspective” report. In cooperation with the International Resource Panel, UN Environment held a training event entitled “Sustainable Urban Infrastructure Transitions and the New Urban Agenda” which was a platform for launching the summary for policy makers of two reports, namely “The Weight of Cities: Resource Requirements of Future Urbanization” (from the International Resource Panel) and the “Sustainable Urban Infrastructure Transitions in the ASEAN Region: a Resource Perspective.” These reports will formed the basis of the training. Ms. Martina Otto, Head of the Cities Unit at UN Environment, introduced the session that was divided into three blocks. The highlights of the discussion were on the need for partnerships with academic institutions. In addition, Mr. Mungkasa underscored the need for help in implementing the recommendations (in terms of governance and financing, which were tackled in the last block). The reactions from the discussants regarding the five pathways (from different sectors) were seen as very positive, as often the recommendations are very sector focused. The topic of integrating behavior, as well as governance and financing once again, were recommended to be considered as future avenues for research. Ms. Anni Beuekes from Slum/Shack Dwellers International (SDI) speaking during the joint UN Environment-IIED workshop. 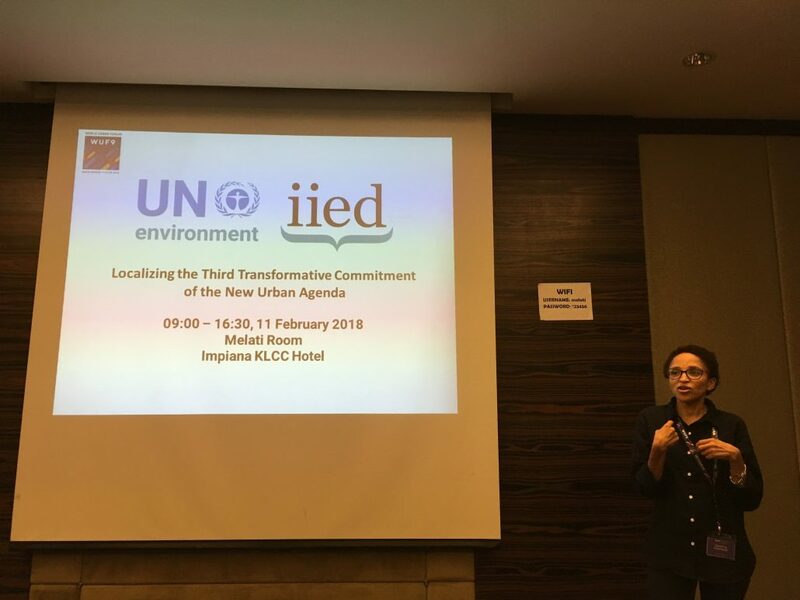 UN Environment and the International Institute for Environment and Development (IIED, a GI-REC partner) organized a closed-door day-long workshop on Localizing the Third Transformative Commitment of the New Urban Agenda, held at the Impiana KLCC Hotel on 11 February 2018. The aim of this event was to engage the participants in the discussion on the implementation of this Third Transformative Commitment, and to provide them with knowledge on possible ways to do this through the localization of this commitment and tracking the progress of its implementation, taking into consideration how it links with other global environmental agreements such as the SDGs, Sendai, and Paris Agreement. In particular, participants actively engaged in the process of reviewing existing indicators that are able to support this process, and identifying new indicators and ways of gathering necessary data to support these.